This is a preprint, in which the shortcomings of current Slowly Changing Dimension types are discussed, along with a suggestion to “fix” dimensional modeling using temporal dimensions. Performance tests and results are included, along with the discovery of the twine, a novel approach to achieving high performance for queries that need to retrieve historically correct relationships. This is a preprint, formalizing Transitional Modeling, a mathematical model upon which many other modeling techniques can rely, and special cases among them are concurrent-reliance-temporal Anchor Modeling, Data Vault, and the third normal form. In transitional modeling, the information, its model, its types, and its constraints are all expressed through two simple constructions; the posit and the assertion. This makes it possible for all of them to evolve over time and to be disagreed upon or unsure about. This presentation explains some features of modern query optimizers that help turn joins into speedups. Among those features are clustered and ordered indexes to avoid sorting, table elimination to exclude tables from the execution plan, and column statistics with cost based optimizing to find the optimal join order with respect to reducing the intermediate result sets. A keynote version can be downloaded by clicking here. A presentation outlining the formalization of Anchor Modeling, showing how uni-temporal Anchor is built around posits and how these are used in assertions in concurrent-reliance-temporal Anchor. The symmetry between negative and positive assertions is presented and how it can be used to transform assertions into canonical form. The axiom of non-contradiction, including the formula for ensuring it, is also found in the presentation. A keynote version can be downloaded by clicking here. Golf is a great game and it is also very fitting for showcasing some of the features in Anchor, particularly bitemporality and reliability, but also concurrency, since you often play it together with others. This presentation shows the development of the score, the accumulated number of strokes, which is normally posited after each played hole and then recorded on a score card. It also shows how to find the score in bitemporal effect, given a point in bitemporal time that you want to travel to. A keynote version can be downloaded by clicking here. When working with information, confusion is sometimes unavoidable. To be more precise, when the process of identification cannot give unambiguous results, such confusion arises. But don’t worry, in Anchor you are allowed to be confused and push that problem into the future, to solve it when you find the missing pieces, while still retaining analytic capabilities. Simply store all the possible outcomes in advance, with different reliabilities, or store the most likely scenario and correct it later if it was wrong. A keynote version can be downloaded by clicking here. rst time in massively parallel processing databases. A case study of how this approach is used for a Data Warehouse at Avito over two years time, with estimates for and results of real data experiments carried out in HP Vertica, are also presented. You can also download an accompanying PDF presentation by clicking here. This presentation was first held at DMZ Europe in Hamburg, 2015. Please note that the file is rather large, at 38MB, due to numerous high resolution images. 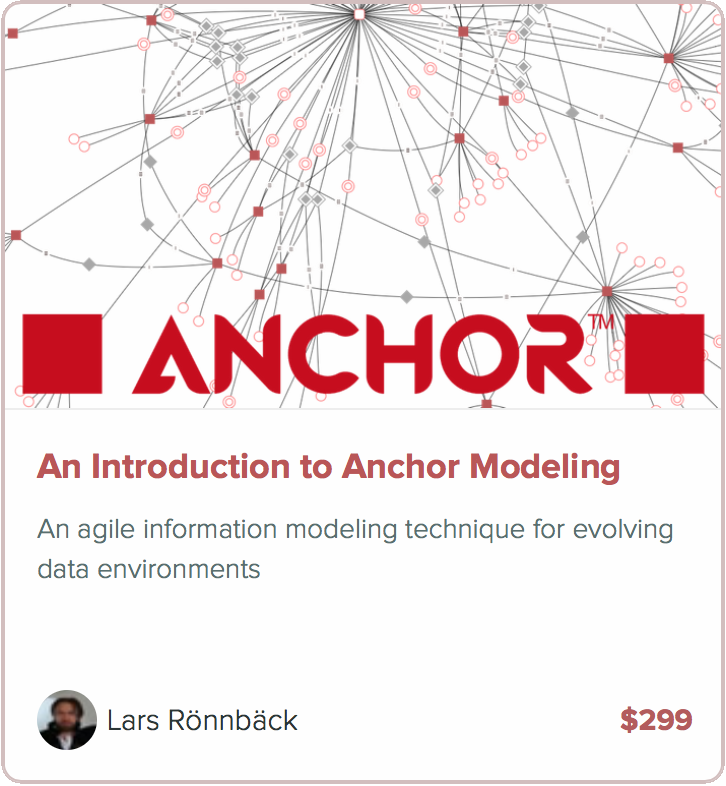 It serves as an introduction to Anchor modeling, focusing on what it is, rather than how it is done. For those also interested in the how, the Back to the Moment presentation further down on the page is suitable. A keynote version can be downloaded by clicking here. An exercise that is part of the Anchor Modeling Certification Course. The exercise intends to provide an introduction to the modeling concepts in and highlight some of the specifics of Anchor Modeling. The scenario is to build and later extend a database for a new regulatory authority that will monitor all stock market transactions. An exercise in Anchor Modeling that involves many of the features found in concurrent-reliance-temporal modeling. The exercise is to build a database for an iceberg tracking and drift prediction system. Its goal is to track and predict the movements of icebergs in order to avoid collisions with vessels traveling on or below the oceanic surface, and allow for better route planning in the presence of icebergs. What if you could travel in time and become someone else? A presentation of concurrent-temporal Anchor Modeling, that was first held at the Next Generation DWH Modeling event in Amsterdam, the Netherlands and later extended for Data Modeling Zone in Hannover, Germany and Baltimore, USA. It is also the presentation held at the Data Warehousing guest lecture at Stockholm University in 2013 and 2014. Keynote version can be downloaded by clicking here. This is an example showing how inflation is estimated every year in two scenarios, the most probable and a worst-case development. In our terminology, we have a multi-bi-temporal model with two positors, and decreasing reliability as the prognosis stretches further into the future. This is a comparison sheet between Anchor Modeling and Data Vault, that highlights some of the most important differences between the two techniques. The topic of this presentation is the temporal features of Anchor Modeling, and how temporal referential and entity integrity is elegantly handled through the use of immutability. PowerPoint version can be downloaded clicking here. The presentation held at the Big Data Event at The Museum of Modern Arts in Stockholm, April 26th, 2012. Note that this presentation is in Swedish. The presentation held at Stockholm University and later at Ordina in the Netherlands 2011. The study day presentation held at the Anchor Modeling Week (HAN) 2011. The presentation held at the Anchor Modeling Week (HAN) 2011. The presentation held at the GSE Nordics 2011 Conference. The article published in Data & Knowledge Engineering in 2010. Appendix to the DKE Anchor Modeling Paper. Test results from various performance tests, as well as scripts for reproducing the tests. Used in the DKE Anchor Modeling Paper. An article on the different table types in anchor databases and their relation to 6NF. Referenced from the DKE Anchor Modeling Paper. An article describing the three different ways time is modeled in Anchor Modeling. The presentation held at the ER’09 Conference (where we won the best paper award). The presentation held at the TDWI 2007 European Conference.